Superman is part of Warhol’s Myths portfolio, which also included characters such as Superman, Mickey Mouse, and Dracula.An iconic figure that many are familiar with, Superman is a character that originates from comic books and has been a hero to many for decades. 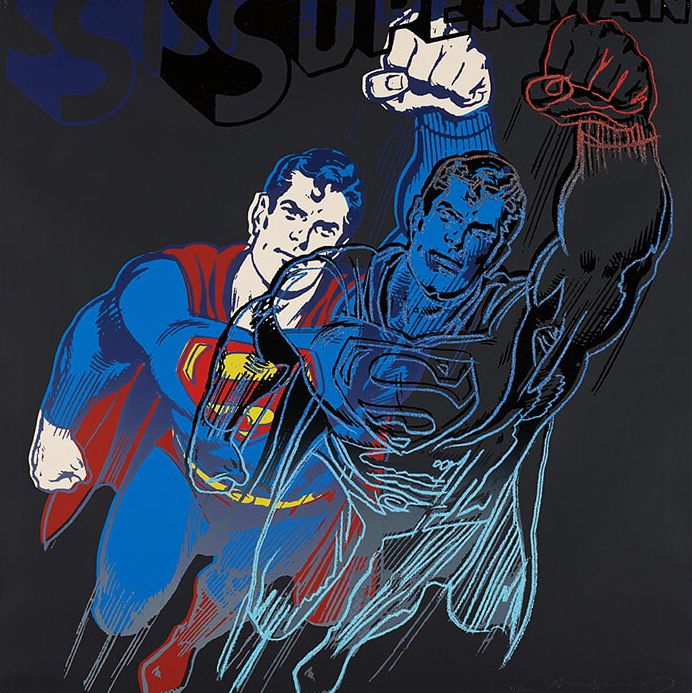 The traditional image of Superman in his blue and red cape is juxtaposed with a lighter outline of the same image, suggesting we have captured him in the middle of his ascension. The Myths Portfolio is one of Andy Warhol’s most sought after collections. Andy Warhol’s Myths collection contains ten screen prints of iconic mythical figures, including Santa Claus, Mickey Mouse and Howdy Doody, among many others.From the 1960s on, Andy Warhol exhibited an unerring sense for the powerful motifs of his time – contemporary images that capture the modern imagination as completely as the gods and goddesses of ancient mythology once did. In Myths, Warhol’s 1981 portfolio of 10 screen prints, he was referring not to remote civilizations, but to the beginnings of the cinema and the imaginary characters loved and recognized by millions all over the world. Most images in Warhol’s Myths series are taken from old Hollywood films or 1950s television and portray the universal view of America’s once enchanted and powerful past. Included in the series are characters loved by children such as Mickey Mouse, Howdy Doody, and Santa Claus, as well as fictional figures like Dracula, The Wicked Witch of the West, and Uncle Sam.